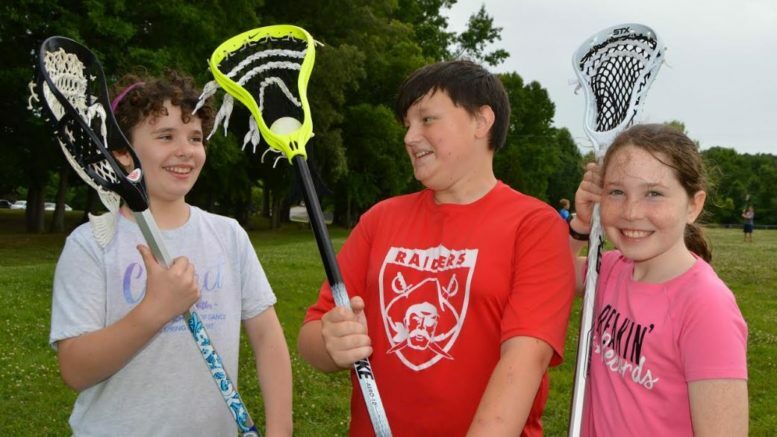 Bridget Lynam, Bowen Rinehart and Anna Kate Correll, from left, enjoy last year’s Lacrosse Camp, one of several recreational and athletic camps being offered this summer by Cookeville Leisure Services. Registration for Basketball Camp is already open. Registration for all other camps opens April 15. All campers must complete a registration form, which, along with a summer camp handbook, is available at www.cookeville-tn.gov/ls/camps. Space is limited. This camp, a partnership between Leisure Services and 1Shot Athletics, is being offered June 3-7, June 24-28 and July 15-19 from 8 a.m.-4 p.m. at Cane Creek Gymnasium. Campers ages 7-15 will engage in various drills and shooting techniques with Coach Jermaine McElvain. The cost is $80 per week if registered by the Friday before camp or $20 per day drop-in. Lunch and an afternoon snack will be provided by the Putnam County School Nutrition Program. To register, call 931-526-9767. Online registration is available at www.cookeville-tn.gov/ls/camp, but a registration form must also be completed and turned in. Be the first to comment on "Leisure Services Summer Camp Registration Opens April 15"